Lightly grease a 9-inch metal pie pan. In a large bowl, combine the beaten egg with the sugar and fold in the apples. Stir in the baking powder, flour, salt, vanilla and walnuts and spread the mixture into the pan. In Recipes-list.com we have selected the most viewed recipes from category - uncategorized . Enjoy the best recipes specially selected for you! 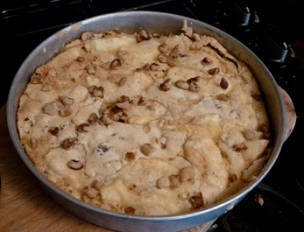 Black Walnut and Apple Torte is the right choice that will satisfy all your claims.